Although many watch manufacturers claim to have invented the wristwatch, such a simple thing as strapping a watch to one's wrist didn't actually need to be "invented" - it is obvious. That is why there is no patent for the wristwatch; something obvious cannot be patented. However, the story of how the watch came to be worn on the wrist, or at least on a man's wrist, is interesting. In their monumental "Technique and History of the Swiss Watch" (ISBN 0 600 03633 2, and weighing in at nearly 2.5kg, truly monumental) the authors, Eugène Jaquet and Alfred Chapuis, relate the following story about the invention of the wristwatch: "Much has been written about this subject, and we ourselves have heard the following story from an old engraver: A good woman, seated on a bench in a public park, was suckling her child. In order to observe the time, she had attached her watch around her arm. A passer-by was struck by this naive ingenuity. On his return home, he soldered two lugs on to a lady's watch, and added a strap." Are Jaquet and Chapuis really expecting us to believe that the combined brains of the watch industry, which had produced such mechanical complications as the chronograph, minute repeater, perpetual calendar, and the tourbillon, were unable to come up with the idea of soldering two bits of wire on to a watch case before they saw the "naive ingenuity" of this good woman? Emphatically No! Professor Jaquet and Doctor Chapuis were two very eminent horologians. Professor Eugène Jaquet was Principal of the Geneva School of Horology, and Alfred Chapuis was Doctor Honoris Causa of the of the University of Neuchâtel. Just about every watch manufacturer claims to have been the first to make a wristwatch, and this story is Jaquet and Chapuis poking fun at these claims. Notice how they say "... and we ourselves have heard the following story ...", pretending to throw another (obviously ridiculous) story into the mix, whilst at the same time pointing out that strapping a watch to ones wrist is merely "naive ingenuity" and not a massive technical breakthrough. Creating an open face wristwatch with the 12 in the right place on the wrist, the seconds display at 6 o'clock, and the crown at 3 o'clock, requires much more than just soldering a couple of wire lugs onto a fob watch. The first purpose made men's wristwatches were created in the early 1900s by the paradoxical move of putting a savonnette movement into a specially made Lépine case, which I explain at purpose made wristwatches. But this was not difficult technically, and it certainly didn't hold up the use of wristwatches by men. Would men wear something that looked like a bracelet? Could a watch small enough to be worn on the wrist keep accurate time? Rather than a massive technical breakthrough where some genius had a flash of inspiration, the true story of the man's wristwatch is of how it overcame these social and technical barriers. One of the earliest references to what we would perhaps now call a wristwatch, or at least an "arm watch" was the new year gift received by Queen Elizabeth from Robert Dudley, the Earl of Leicester, in 1571. It was a richly jewelled armlet, having "in the closing thearof a clocke, and in the forepart of the same a faire lozengie djamond without a foyle, hanging thearat a rounde juell fully garnished with dyamondes and a perle pendaunt." What exactly this item was is not known because it no longer exists, but it clearly contained a spring driven clock or watch, and was intended to be worn on the arm, presumably somewhere where the watch would be easily visible, which would mean the forearm or wrist. 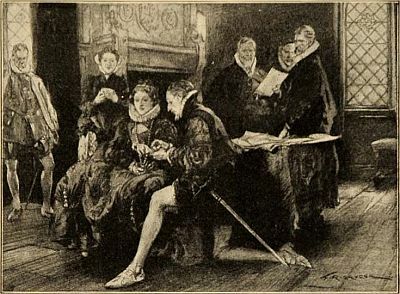 The imaginative illustration shown here is taken from a 1926 Gruen Guild advert and shows Robert Dudley presenting the queen with her wristwatch. In fact, as David Landes points out in " Revolution in Time", as soon as the spring driven clock became small enough to be carried about and worn as an ornament, it was inevitable that someone would do so. And someone to whom cost was no object would then have one made that was smaller and finer and better; and they would then be emulated, and so the trend would spread. In addition to the watch referred to above, it is known that Elizabeth had a watch set in a ring. And it was not only a timekeeper, it also served as an alarm; a small prong gently scratched Her Majesty's finger at the set time. Needless to say it was probably not a precision timekeeper, but it was certainly a tour de force of miniaturisation for the sixteenth century. The first wristwatches we have details of were small watches on bracelets (bracelet-watches or montres-bracelets) intended for ladies. An account book of Jaquet-Droz and Leschot of Geneva mentions in 1790, "a watch to be fixed to a bracelet." When Eugène de Beauharnais married Princess Auguste-Amélie of Leuchtenbergin 1809, the Empress josephine presented her daughter-in-law with two bracelets, one containing a watch, the other a calendar. These were made in 1806 by the Parisian jeweller Nitot. In 1810 the famous French watch maker BréguetPronounced "Bre-gay" was comissioned by the Queen of Naples to make a wristwatch, which was completed in 1812. Patek Philippe made the key-winding lady's bracelet watch shown on the left in 1868 for the Countess Koscowicz of Hungary. Similar developments were taking place in Switzerland. In February 1889, Albert Bertholet of Bienne registered a claim, which was granted Swiss patent number CH 576 in April 1889, for a "Montre bracelet simplifiée" or simplified wristwatch, which implies that there must have previously been a more complicated wristwatch. Bertholet's simplification was to do away with the winding and setting by crown and stem. The watch was wound by turning the bezel, which was geared directly to the mainspring barrel; to set the hands a gear, which engaged directly with the cannon pinion, was brought to a small slot in the side of the case so that it could be turned with a finger. M. Bertholet does not specify whether his montre bracelet was intended for men or for women but, given the name "bracelet watch" and the prevailing fashion at the time, we must suspect that if ihis invention was used - and I have never seen even a mention of a watch with this type of winding - it would have been in ladies watches. In the 1890s, in Switzerland as everywhere else, unless it was being used to tell the time, a man's watch was firmly ensconced in his pocket. By the middle of the nineteenth century many, if not most, watch makers were producing bracelet watches, often with elaborate enamelling and jewelling of saphires, rubies, or diamonds. 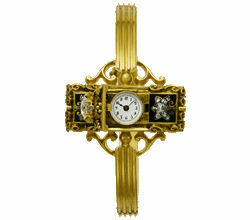 These early pretty, jewellery like, bracelet watches were worn by ladies. Men considered that wrist watches were too small to be properly engineered in order to keep time accurately; and too prone to damage by shock, or contamination with dust and moisture due to their exposed location; and, perhaps most damning of all, effeminate: because wristwatches were only worn by ladies. A gentleman who wanted to keep track of time carried a pocket watch, usually tucked into a pocket of a waistcoat, a garment introduced by King Charles II in the 17th century, on the end of a long "Albert chain," a chain introduced by Prince Albert, the consort of Queen Victoria, which had a clip at one end to attach to the bow of the pocket watch and a bar at the other to fasten it to a button hole to prevent the watch being dropped. This was a long standing fashion of how a true gentleman dressed to present himself to the world. Apart from fashion, there was another challenge for makers of wristwatches to overcome. Portable watches had developed from miniaturised spring driven clocks in the 15th or 16th century, and had been gradually made smaller and slimmer. But there was a general perception, which had an element of truth about it, that an accurate watch needed to be of a certain size, and that to make it small enough to be worn on the wrist would be to sacrifice accurate timekeeping. The final challenge that a wristwatch had to deal with was what safety engineers call "hazards". The environment within a waist coat pocket is relatively benign; warm, dry and relatively protected from shocks. But strapped to the end of an arm, the wristwatch is exposed to all manner of hazards and rough treatment, it is prone to getting knocked, exposed to dust and splashed with water. All of these hazards presented problems to watch movements of the time, which did not live in hermetic cases, and therefore would get gummed up if dust mixed with the oil, rusty if moisture got in, and were prone to shocks breaking the delicate pivots of the balance staff, only a few 10ths of a millimetre in diameter. The true story of the wristwatch, or at least of the man's wristwatch (because as we know ladies wristwatches had been available for centuries) is of how it overcame these technical and social barriers to become an essential part of every man's wardrobe - just as the finest and most complicated wristwatches still are today, despite the fact that, with every gadget from phones to computers having a clock built in, they are no longer needed to tell the time! To move on to the next chapter in the invention of the wristwatch, please go to the page about wristlets and converters. Copyright © David Boettcher 2006 - 2019 all rights reserved. This page updated July 2018. W3CMVS.